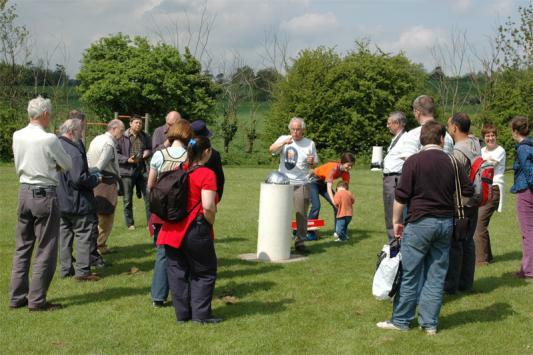 May 7th 2006 was a glorious sunny day, perfect for walking around the Solar System Walk at Otford. I had been looking forward to the walk as the scale of the Solar System is something that has always fascinated me and I have often thought about making a scale model myself. We all met at the pub to start with for lunch, then after a pint and a hearty meal made our way to the car park to meet up with David Thomas, the creator of the model, who was to give us a guided tour of our Solar System. 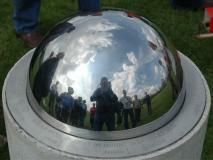 We made our way to the Sun, which was a football sized gleaming ball of steel in the centre of a field. Mercury, Venus, Earth and Mars were all visible from this vantage point. The interesting figures were then imparted to us from Mr. Thomas. 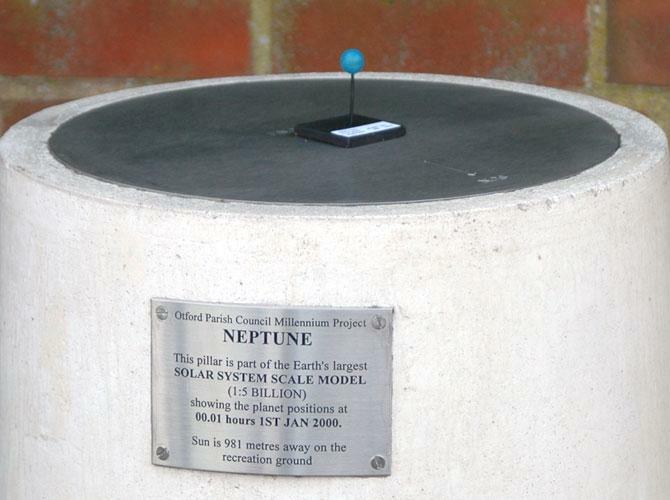 The scale of the model is 1:4,595,700,000 (ie 1mm = 4,595.7km). 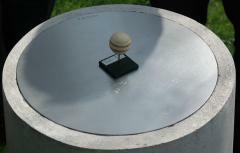 The Sun is represented by a 303mm diameter dome and each planet by a scale engraving on a flat disc. The positions of the pillars reflect the positions of the planets at midnight on 1 January 2000. On the scale of this model, the nearest star is 8,844km away, near Los Angeles USA. If you were to cross the Milky Way, our local galaxy, you would have to stay on board the jet for twenty four years. The diameter of the orbit of Mars was 45 metres. Mars itself was 1.49mm in diameter, a mere pinprick. After hearing some interesting facts about the model and the planets out to Mars we then took a leasurely stroll over to Jupiter which could be seen on the far side of the field at 161 metres from the Sun. Jupiter was a sphere 31.28mm in diameter and from here you could look back across the field at the Sun which just looked like a small pea held at arms length from that distance. This was already getting mind boggling. We were already starting to grasp the vastness of space. The huge expanse of nothingness between the tiny ping pong ball that was Jupiter and the football sized sphere that was the Sun right across the other side of the field made you stop and think. Jim made a comment that made it all even more mind boggling. He commented that he now had a lot more respect for those engineers, scientists and mathematicians who send tiny spacecraft across millions of miles of nothingness and manage to land them on. It certainly made me think as looking at the Solar System on this scale you realised how tiny everything was and how much empty space was between the planets and to add the factor that all of these tiny objects were moving at high speed and the spacecraft would be the size of an atom to them it really made you raise your eyebrows and go “Wow” when you thought of what was involved in trying to accomplish such a feat. It made all of those spacecraft failures seem like they should be the norm instead of the successes. 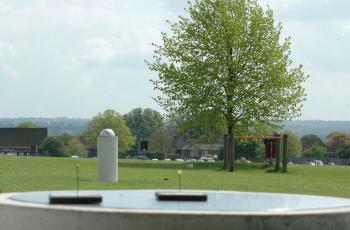 We then took a shortish walk out to Saturn and after digesting some facts about the gas giants made our way to the Heritage Centre where there were some models of stars and we were able to look at the displays about the local history of Otford. It was then onto Uranus out on the main road. From here you were able to look back at the Sun in the playing field. From this distance the sun was no bigger than the full stop at the end of this sentence. From here we crossed the road to get to Neptune and then it was the long walk across open fields to tiny Pluto to end the tour. In total the entire walk took us 1 hour and 45 minutes. Pluto was 1km from the Sun. All in all it was a great day and the model is truly astounding. All of us were astonished as to the scales and were shocked at the tiny sizes of the planets and the huge amounts of nothing in between them. I would highly recommend the walk to anyone who didn’t go on May the 7th. 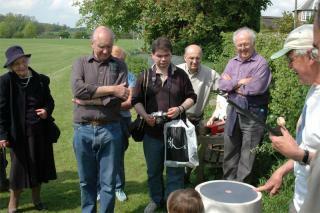 For more information visit the Otford Solar System website.